With spring in full swing and Earth Day coming up, I’d love to share some of the small and easy ways our family is going greener this year. Create a DIY cleaning product. I’ve seen countless tutorials online, but I eventually ended up combining several ideas and making this one! I love the way it cuts grease on the kitchen counters, removes grime from cabinets, and gently cleans my kiddo’s high chair — and all without chemicals or a penny spent! Grow one thing you can eat. We love our garden, and over the years we’ve become more and more experimental with veggies. Try regrowing a veggie that you’ve already used from your fridge! Simply save the bottom, stick it in a small cup of water, and it will grow roots! Romaine, green onions and celery work the best for us. Before I had a veggie garden (or knew anything about them) this is what we did, all from our windowsill! Hang your laundry out to dry. Dryers can be energy suckers! If you don’t have a clothesline, don’t worry — you can create a simple drying rack or use one you have! Sometimes if I have a big load and my clotheslines are full, I get really creative and hang clothes on plastic hangers and attach them to the ceiling fan or a curtain rod near an open window. Bonus — it naturally freshens and brightens your clothes! If you have the means, invest in some energy saving lights for your house. We recently purchased these and LOVE them. You can choose from a variety of light colors (bright white, soft yellow, etc. ), and it truly makes a difference in your energy bill! For us, these only cost $8 a YEAR per light to run all the time — if we never shut them off. Sounds crazy, right? If it’s less energy and less cost, I’m in. 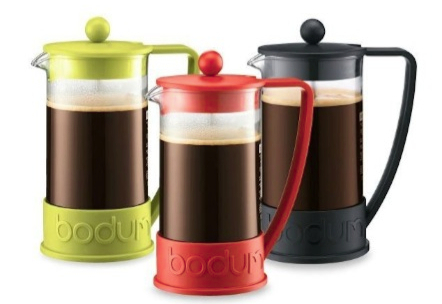 We love bodum French presses! Heating water in a teapot and utilizing a French press can save the energy it takes to run your coffeemaker all night on the automatic setting. You may not have your regular cup of sweet caffeine as quick as normal, but coffeemakers are usually one of those silent and forgotten energy suckers when they’re plugged in constantly. Utilize windows and fans when you can! This may be one of those no-brainers, but I still forget sometimes! The convenience of just leaving our thermostat on is so tempting and easy to do, that I need to remind myself to turn it completely off when it’s between 65 and 80 outside. If there’s still a bit of spring chill in the air, a small space heater can use far less energy than heating the whole house. Choose one day each week to walk your errands instead of driving. Vitamin D and exercise are automatic bonuses! Reuse an old scented plug in with your favorite essential oil! Instead of tossing those magical plug ins, simply take out the wick and refill with fractionated coconut oil (or another carrier oil) and your favorite aromatherpy cure. Check out a great tutorial here! I filled mine with Eucalyptus and Tea Tree oil. For allergy relief, try a blend with lavender, peppermint, and lemon essential oil. I reuse my orange peels to make my DIY cleaning solution and my lemon peels I freeze into water in ice cube trays — they’re perfect for sending down my garbage disposal for a fresh, clean sink! Check out this great article about using citrus for cleaning, too. Incorporate more house plants indoors to clean the air! They can do wonders for those with spring and pet allergies. I love aloe vera (they require way less watering! ), but here are some others that do a super job and allow you to breathe easier.